Wall to Wall is a monthly night at Jazz@PizzaExpress, Dean Street, London, hosted by Lea Delaria, featuring the songs of Cole Porter. Lea brings her own unique style and personality to the show and is the self proclaimed ‘ringmaster’ for the proceedings. 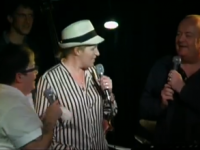 Tonight’s guest is Clare Teal who performs with Lea and a couple of numbers on her own, and there is a special appearance for the night’s encore by Ian Shaw.